Mission briefing Great work in your last mission. But now it is time for the final attack, to completely eliminate the Amarr presence within the troublesome deadspace area in ***. The sensors I had implanted onto your ship detected a gate leading towards their headquarters, within the room where you destroyed the stargate. It is time for you to access this gate and confront the remainder of their forces. I will again implant the sensors onto your ship, so expect me to contact you once you warp through the acceleration gate leading to their headquarters. You need the Imperial Gate Permit to activate the gate that leads into the first stage! Empty, just fly to the next gate. You can easily kill the right spawn first, then the left one and as last the middle one. After that, kill the Manufactory Plant which has a hell of hitpoints! * I got almost continously jammed until the Tendais bought it, so kill these first. The Oshiro isn't nearly as annoying. * I killed the groups in the order above, with mostly drones. ie, no buddy aggro "feature" here. * I'd advice you to heed ShadowInformants advice above, NO messing with the towers until you're prepared tank everything that's left. 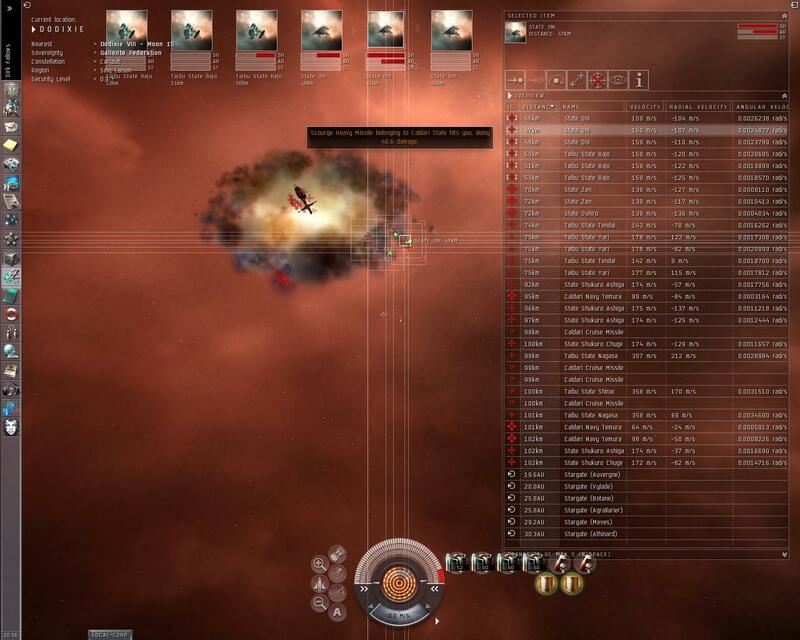 8:44am 2006 Tuesday 5th December 2006 some of the spawns have jamming cruisers now "Taibu state Tendai"
10:09pm 2006 Wednesday 29th November 2006 Caldari spawns changed substantially, given new names and they seem to have removed railguns completely. 8:20am 2006 Saturday 15th July 2006 Completed with an Eos and T2 hardner setup (EM, Thermal, Kinetic). I used 3x150mm Railgun II and small drones for the frigates and spider drones. 4x 250mm Railgun II and 5x Ogre II's took out the cruisers and battleships. The groups in the last stage can be aggroed separately, as long as you don't mess with the missle batteries. Pretty fun mission, especially when I realized I could have solo'd it.